Quality Testing is a process of verifying a computer system or program to decide whether it meets the specific requirements and produces the desired results. It is important to identify and bugs in the software or the program. This involves the Static and Dynamic methodologies to test the application. Quality Testing helps to identify the correctness, completeness and quality of developed computer software. Quality Testing requires proper planning and implementation to get effective and correct results. 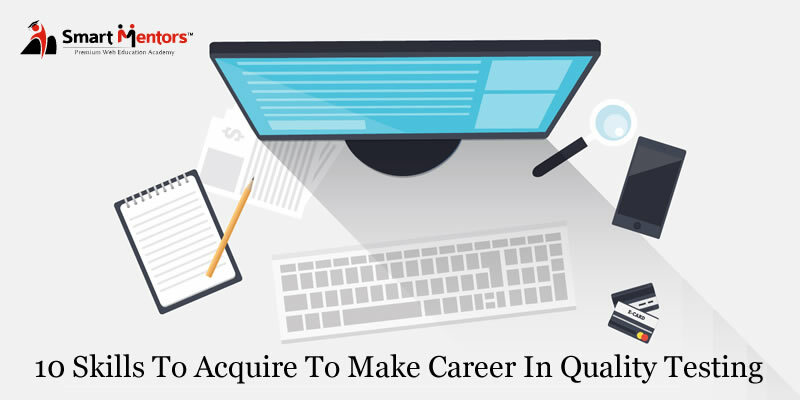 We bring you 10 skills that help you in curating a successful career in Quality Testing. Quality Testing can be a demanding job especially at the time when a software or an application is about to be introduced. A tester must be able to efficiently manage time and workload and plan activities so that high productivity can be achieved. Most of the software applications are deployed on Linux Machines like Web Services, Databases and Application Servers. Thus having an additional knowledge of Linux Commands proves useful. There has been an increase in the complexities and integrations in applications and software. Manual testing alone cannot get the job done. Thus a software tester must learn automation skills to get better accuracy and serve the purpose of business logic and technicalities required. To help the testers, there are different test automation tools available these days that support specific testing type and have multitude of features to get the tasks done efficiently and in a timely manner. For a software tester, it is important to understand the inside workings of the application so that it becomes easy to comprehend it’s functioning and complete coding structure. A tester can create tests easily if they understand the application and can even identify any possible errors in the application code which can further reduce the chance of bugs and errors. Software testers have higher chances to ensure better application quality lifecycle if the learn at least two programming languages. For a successful quality tester, it is important to be rational, analytical and have logical skills that can be applied to testing and identify errors, understand the complexities and assess the unfamiliar behaviour of the application and test them accordingly. This will help them raise clear questions, assess relevant information and identify strengths and weaknesses to get the correct solutions. There are various testing techniques and usage of tools and it is necessary for every tester to be aware of them. The knowledge of different testing types like black box testing, penetration testing, security testing, system testing, unit testing etc. help the testers to be versatile and workout different projects. It is important to have good written and communication skills to be a good software tester. A tester will need to share and update the project status with the clients, inform about requirements to the team, communicate issues to the developers and prepare reports for management which requires effective communication skills. For every tester, it is important to identify the right requirements and take appropriate steps. Test Planning and Documentation skills are important to achieve these objectives. This skill also helps in tracking the changes in requirements, checking test processes of software, trace deviations and helps in reporting and logging of work. Allocation of right budget and resources also depends on well documented test process. For every tester, it is important to get familiar with the web and mobile technologies so that the can understand the type of application, its built and scalability and apply a suitable course of action for its testing. If testers are able to learn the skills of project management, it will help them develop problem solving abilities. These skills help prepare testers to be accountable and answerable for their work to concerned stakeholders and also undertake responsibility and management for end to end project. Quality testers should continuously strive to learn new things and improve their software testing skills and knowledge in order to be successful. A good training program can be a stepping stone to a successful career in Software testing.